Today, university educators are confronting unparalleled challenges regarding declining state education budgets. Meanwhile, an ethos of corporate social responsibility has taken hold in some sectors, where companies define themselves as members and participants in a community, able to offer something besides financial transactions. Engagement and support of educational programs and institutions is an example of one such kind of involvement. This chapter details such collaborations between Grainger corporation, NC4, ESi Acquisition Inc. and the University of North Texas's Emergency Administration and Planning program. The generosity of these private companies helped the program open an Emergency Operations Center training lab on campus to facilitate hands-on decision support systems training, and enhance creativity and problem solving skills in a simulated environment for emergency management students. Such public-private partnerships and outreach efforts to enhance disaster management training and educational experiences of students have the potential to make a real and lasting difference to all players involved. An Emergency Operations Center (EOC) is crucial to managing disasters, because it is where responding organizations' representatives exchange information to prioritize disaster needs (Quarantelli, 1998). Until recently the experience of working in an EOC was out of reach for many students training to be future first responders and emergency management personnel unless they were interning in one of the response organizations or attending one of only a couple of universities with EOC training facilities. However, due to the generosity of two private corporations, the Emergency Administration and Planning Program (EADP) at the University of North Texas (UNT) was able to garner sufficient funding to open the EOC training lab on campus. Subsequently, a third private corporation contributed their product to enhance the training experience for EADP students at UNT. These donors saw the synergy in public-private partnerships through Corporate Social Responsibility (CSR) programs. Interest in CSR, also referred to as corporate social performance, corporate conscience, corporate citizenship and sustainable and responsible business practice has existed since the first half of the 20th century (Carroll, 1999). Carroll (1999) noted that aspects of social concern in businesses could be found in Barnard’s (1938) classic The Functions of the Executive, Clark’s 1939 Social Control of Business or Krep’s (1940)Measurement of the Social Performance of Business. However, he pointed to the modern era of CSR as beginning with Bowen’s (1953)Social Responsibilities of the Businessman. Bowen argued that large businesses have the capacity to impact the lives of numerous citizens. He questioned the responsibility of business executives to those citizens and further defined that responsibility as the obligation for decisions and actions that are desirable with “the objectives and values of our society.” (pp.6). According to Keith Davis, corporate social responsibility is “the firm's consideration of, and response to, issues beyond the narrow economic, technical, and legal requirements of the firm. It is the firm’s obligation to evaluate in its decision-making process the effects of its decisions on the external social system in a manner that will accomplish social benefits along with the traditional economic gains which the firm seeks” (312-313). Drucker (1984) pointed out that one cannot ignore economic requirements when considering corporate social responsibility because if a business cannot meet the responsibility of making a profit then “no other ‘social responsibility’ can be met” (pp.62). He extended his profitability case to suggest that when businesses are in a down economy, they are less likely to be socially responsible in any manner. Carroll (1979) added aspects of ethical expectations which societies place upon organizations as a component of social responsibility while Frederick and Weber (1987) simplified CSR as simply an obligation for businesses to work for social betterment. 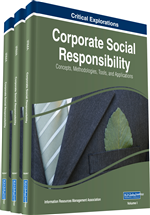 Furthermore, McWilliams, Siegel and Wright (2006) suggest that “Actions that further some social good, beyond the interests of the firm and that which is required by law” (pp.1) could be considered as a CSR program, and may focus on either social responsibility in production and manufacturing processes, human resource practices, environmental performance, or advancing community goals.